NEWS ARTICLE - Featured in CAM Magazine – September 2011. Read the full story below. 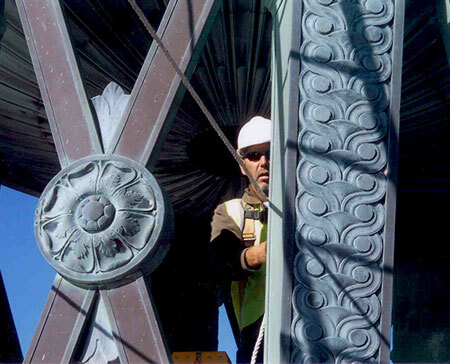 Historic National Landmark is Restored by CASS Sheet Metal! For as long as anyone can remember, American military forces have always fought in faraway locales, but the echo of cannons defending against invading armies and navies can still be heard today. The sound resonates in the boundaries that define our nation and in the abundance of natural resources found within. These lines did not simply appear on a map and they were often drawn in blood. Such was the case in 1813, when Commodore Oliver Hazard Perry defeated the Great Britain’s Royal Navy in the Battle of Lake Erie, thereby ensuring American control of the lake. 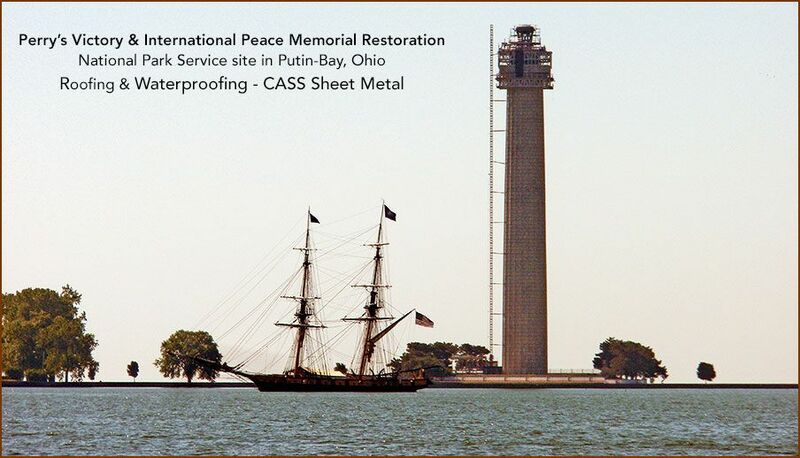 This significant battle, along with the lasting peace between Britain, Canada and the United States, was commemorated with the Perry’s Victory and International Peace Memorial, a National Park Service site in Putin-Bay, Ohio. Substantially completed in 1915, the 352-foot structure is the world’s largest Doric column and the third tallest national monument in the United States. 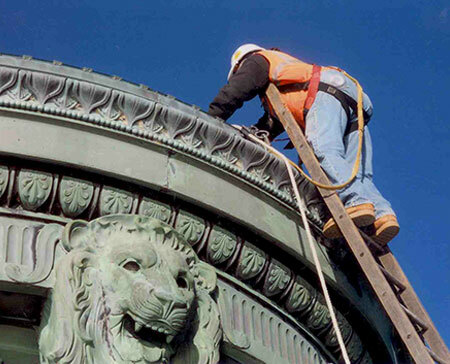 A massive structural preservation effort is currently underway to restore the monument. The work is being contracted to the National Park Service through their Denver Service Center and was funded through the American Recovery and Reinvestment Act of 2009. Key members of the team that is currently fighting the Second Battle of Lake Erie to restore this iconic structure include general contractor The Christman Company, Lansing; architect Wiss, Janney, Elstner Associates, Inc., Northbrook, IL; stone rehabilitation contractor Booms Stone Co., Redford; waterproofing and sheet metal contractor C.A.S.S. Sheetmetal Specialists, Detroit; MI and scaffolding contractor Universal Builders Supply (UBS), New Rochelle, NY. 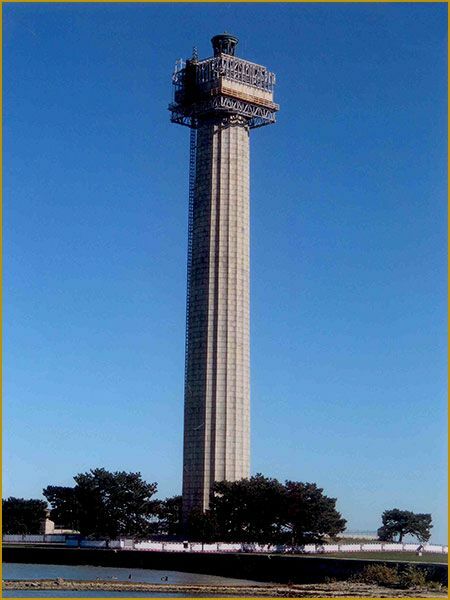 Perry’s Victory and International Peace Memorial is topped by a 47-foot square observation platform that has been closed to the public since 2006. The renovation project is centered on this platform, the penthouse roof and a monumental bronze urn. Since the work would be done at the highest points on the structure, access was problematic. 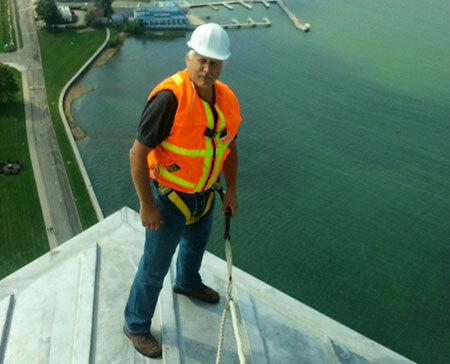 “I think that our biggest challenge on the project was in developing a scaffolding system that would support the observation deck during the concrete demolition and renovation phase,” said Douglas Norton, PE, LEED AP, project executive for The Christman Company. 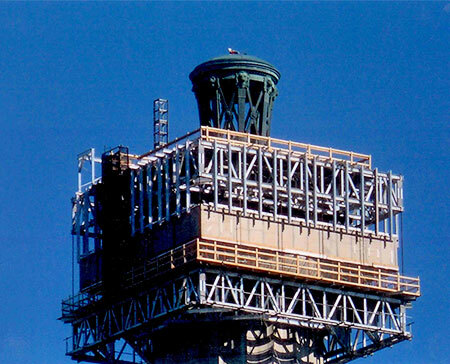 “The system is designed to sit at the top of the column and support the observation deck, as opposed to a conventional scaffold that would rise from the ground. Supporting the scaffold from the column saved time and money, while this approach also prevented thermal expansion from becoming an issue. A metal scaffold would expand during the heat of day and contract at night. This expansion effect would be as much as three inches, when multiplied over the entire 350-foot distance to the ground on a conventional scaffold. 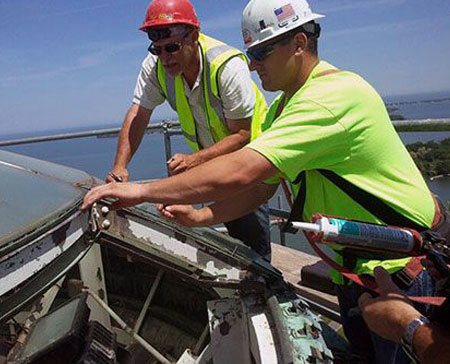 This movement could jeopardize the stability of the observation platform that the team was working to restore. Christman Constructors, Inc., The Christman Company’s self-perform affiliate, removed concrete from the observation platform with surgical precision. Concrete replacement needed to follow a precise sequence to prevent the work from compromising the stability of the structure. 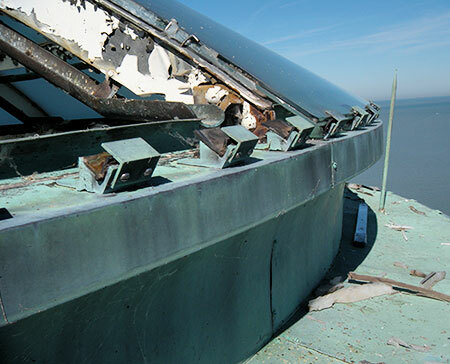 “They removed the outside wall from left to right, top to bottom, to evenly remove the load from the cantilevered observation deck,” said Leigh Woodbury, Jr., project superintendent for The Christman Company. “They didn’t just do one corner and then move somewhere else. It was orchestrated to remove the load evenly.” After completing work on the outside wall, crews turned their attention to portions of the concrete deck that needed repair. Concrete that had been infiltrated by water and subjected to numerous freeze-thaw cycles was quite easy to remove, but other portions that withstood the 100-year onslaught of water were extremely hard. No matter what the condition of the concrete was, crews were limited to small tools to prevent damage to the rebar within the concrete. Stone restoration work was similarly labor-intensive. 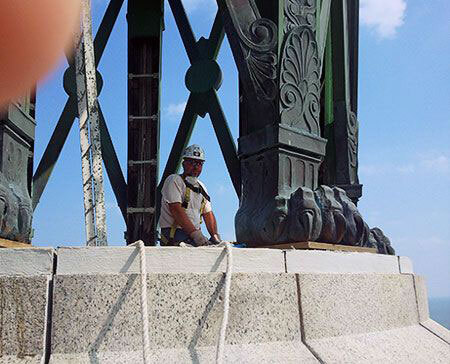 Stonemasons are accustomed to working with heavy materials, but not necessarily under the conditions that were present at Perry’s Victory and International Peace Memorial. In addition to 68, 3’x3’ interior fascia pieces, Booms Stone removed and replaced three granite slabs on the exterior, each of which each weighed approximately 3,500 pounds. “UBS did a wonderful job of creating a monorail system 350 feet in the air at the top of the scaffold,” said Rich Booms, assistant project manager for Booms Stone. “That really made a difference working so high in the air.” The monorail carried stone pieces over to a high-speed buck hoist for transport to ground level. Booms Stone worked closely with The Christman Company and UBS to ensure that the monorail could accommodate the weight of the stones and offered adequate clearance to accommodate them, but replacing stones was only a small part of the overall challenge. Booms Stone also addressed damage to the concrete structure by coring 200 holes through the granite slab to install engineered stainless steel anchors into the concrete. This work needed to be done very slowly, as workers needed to carefully monitor for the slightly different “feel” that their machines would produce if they stuck reinforcing steel within the concrete. “We were working off of drawings that were produced almost 100 years ago,” said Bob Doil, project manager for Booms Stone. “The challenge with the coring was that we really didn’t know where the rebar was in the structural concrete.” Both Booms and Doil praised the efforts of Dan Nault, foreman for Booms Stone. Nault has worked in the business for his entire adult life and Doil explained that Nault handselected workers for the job based on their “experience and level of knowledge,” while Booms added that courage was also a requirement considering where they would be working. In spite of the dizzying heights at which Booms Stone plied their trade, workers for CASS Sheet Metal would need to climb just a little bit higher. on Lake Erie’s South Bass Island, which is only accessible by ferry or airplane. Any contractor who performed work would need to factor in a premium for simply traveling to the site and climbing the scaffold, so Glenn Parvin, president of CASS Sheet Metal, discussed the benefits of bundling several trades under one contract with The Christman Company. CASS Sheet Metal waterproofed significant portions of the structure; restored metal elements, installed a new zinc-coated copper batten-seam roof covering the penthouse, performed flashing and sheet metal work; replaced a small section of EPDM roofing; and even took responsibility of replacing custom-made historic glass panes in the 22-foot-tall bronze lantern that caps the structure. Limiting the number of contractors gave The Christman Company single-source responsibility for multiple trades, but success depended on CASS Sheet Metal’s ability to adapt and learn. “I’m not a glass guy,” admitted Parvin, “but I figured, ‘You know what? It’s just three or four pieces of glass, and we have friends in the glass industry who would be willing to lend a hand.’” Parvin brought Rob Luscombe, president of Curtis Glass Co., Inc., Troy, onto his team as a consultant, though it was ultimately Parvin’s employees who would scale the bronze lantern to remove glass panes that were about the size of an automotive windshield. This portion of the project brought Parvin’s workers higher than even UBS’s brilliantly conceived scaffolds could reach. “We had to remove the cracked panes in the skylight dome, but the scaffolding was only erected about 30 feet beneath this,” said Parvin. “We had to set up a ladder and a harness and rope fall arrest system, so we were using a 32-foot extension ladder, off scaffolding that was already 300 feet in the air.” Although the metal-deck scaffold was more robust than many workers are accustomed to, the ladder was tied off and the workers were protected by a fall arrest system, the act of removing these panes and bringing them down to the scaffold was a nerve-wracking experience. 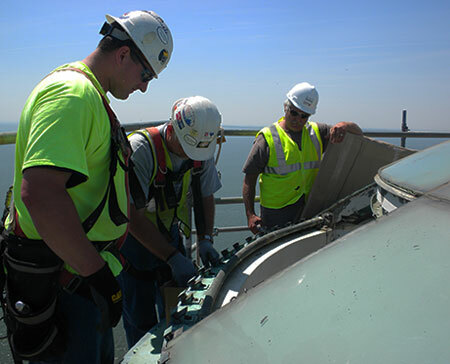 Though they never faced the peril of an actual battle, the contractors who are working to restore Perry’s Victory and International Peace Memorial are helping to preserve the memory of the brave mariners who won the Battle of Lake Erie and helped shape the country in which we live today.